The campaign to end duck shooting hit the road! These ducks were on the streets of Melbourne 'driving for change'! The Victorian government prides itself on being all-in for families. But, there's one family unit who needs them desperately. And over the 2016 duck shooting season, in a strategic initiative, we took their message to the streets in a way that was impossible to miss! Sometimes, if you can't bring politicians to the ducks — you just have to take the ducks to the politicians! 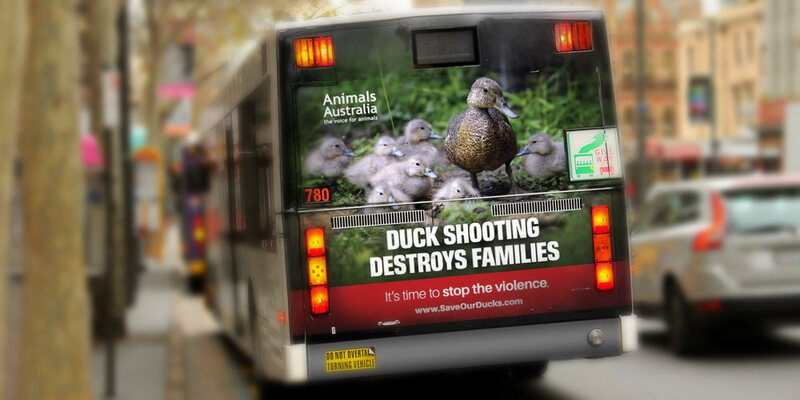 And with these buses rolling through Melbourne's streets, it was hard for Victorian Labor to ignore the message: duck shooting destroys families. These 'moving billboard' bus backs are just another part of our wider, multi-faceted campaign to end duck shooting. Our investigators have braved wetlands at dawn, crouching in reeds and freezing mud for hours on end, all in order to capture what shooters don't want caring Australians to see: nature reserves polluted; protected and threatened species killed; and waterbird families ripped apart. This damning evidence gave our laywers the ammunition they needed to take unprecedented legal action on behalf of ducks, resulting in wetlands being closed — and more than 80,000 waterbirds being spared the terror of being shot at, killed, or 'winged' and left to suffer an excruciatingly drawn-out death. But we're determined to make all of Australia's wetlands safe harbour for our precious native waterbirds. So from swamps to the Supreme Court — and now on all the roads in-between — with your support we will continue to go wherever we need to in order to best protect animals from harm. The Victorian Labor government has the power to put an end this cruelty — but they need to hear from you first. Please urgently send a polite e-mail to your State MP, reminding them that caring Australians expect the government to keep native animals safe — not allow them to be shot.